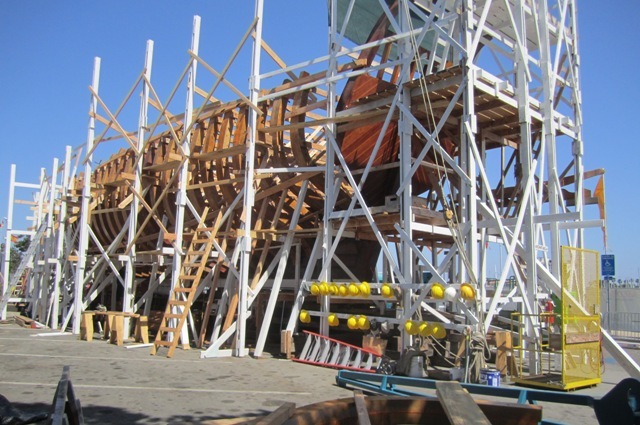 Local media has covered the construction of the replica of the galleon Spanish explorer Juan Cabrillo used when he sailed into San Diego Bay back in 1542. 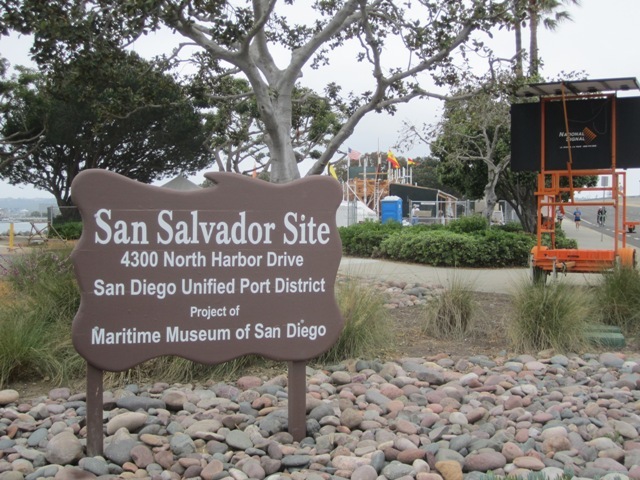 The San Diego Maritime Museum – in conjunction with the City and Port of San Diego – are sponsoring the building of the boat modeled after the San Salvador, itself built 500 years ago on the shores of Mexico, over at Spanish Landing. Begun in February 2011, the ship is now a quarter completed – with the plan to have it finished by November 2013. One of the big threads in the story of this ship being built is how it’s being built. 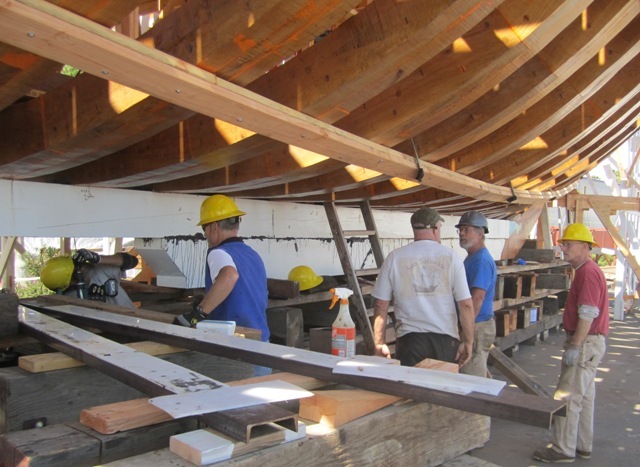 Not only are ten different kinds of wood being used – hauled in from Africa and South America, and other places – , and not only are the workers using the same technology – outside of the power tools, but the new San Salvator is being built mainly by San Diego volunteers. This is the big story here. OBcean Eric Gerhardt runs the volunteer program. We met the head of the volunteers – the guy who coordinates them – the other day after he offered to give OB Ragsters a tour of the site. Eric Gerhardt – a white-bearded OBcean – greeted us at the chain link fence, next to the visitors’ entrance. Normally for $5, you can enter and watch the people constructing the boat, view models, try on Spanish-era apparel, check out all the wood being used, and generally check the scene out. Eric was going to take us behind the barriers – into the work space itself, and even up into the guts of the vessel. Eric loves what’s he’s doing at the site. He showed up to volunteer one day, and now he’s the paid staffer who schedules the other volunteers – up to 60-plus are steady volunteers. And he’s a natural leading and showing people – Eric was a school teacher for dozens of years up north in Napa County. He grew up, however, right here, right over the bridge from where the boat is being constructed, over in Point Loma. He went to Dana Junior High and graduated from Point Loma High in 1964. He had moved away from his ancestral home here in San Diego to spend most of his life in the northern end of the state, getting married, divorced, and having three sons – all g rown now. But Eric had heard about the project – about the building of the San Salvador – and he was very interested. After leaving teaching, he ran a gristmill for 7 years. Upon retiring from that, his interest was peaked on the San Diego project. Around that same time, somebody offered to buy his house – and that was it. The heavens were telling him to move back. And he did. 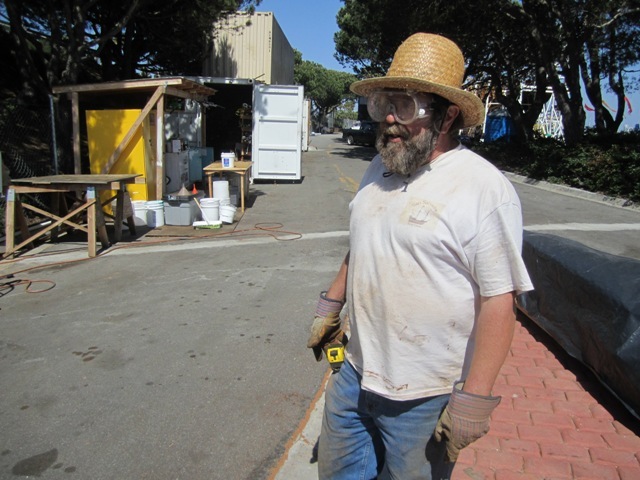 Once Gerhardt arrived in San Diego, he showed up at the site. For the next three months, he worked as a volunteer, as a sweeper, a painter, a general gofer – and he did this at least 40 hours a week. He loved it. Somebody noticed. When changes swept in, he was made the full-time paid volunteer coordinator. Eric was now leading us up the ladder into the bowels of the ribbed monster. He gets about 15 volunteers a day, he said. As he said earlier, he has more than sixty steady people – mainly men – but there’s 6 or 7 women. Plus he has a more, general list of over 300. “I don’t care what your skills are. A carpenter, or whatever. You have to start as a sweeper to get to know our safety and cleaning rules.” He was very adamant about this. Eric’s still part gofer. Besides coordinating the schedules, he runs to Home Depot, and does other tasks. Rules or not, as far as we could see during our tour, the guys working seemed to be really enjoying themselves. The day we were there, at least a dozen men – most of them appearing to be of the retirement age – were engaged in various drillings, liftings, movings, sanding, cutting, driving the forklift …. Eric took us over to the side of the site and uncovered sheets of wood planks piled neatly in large sheds. 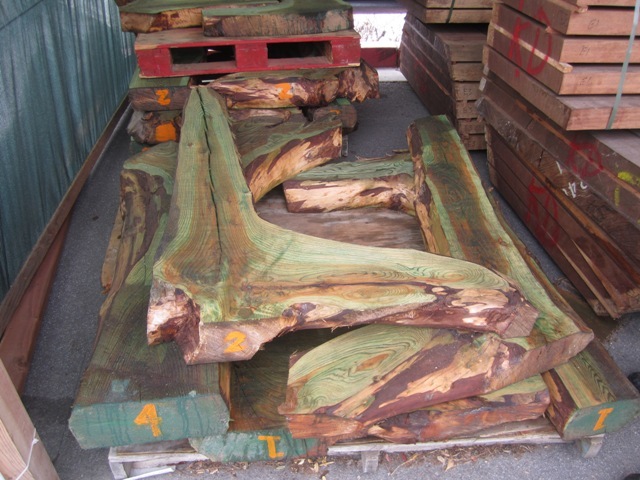 Some of the wood has to be steamed in order to be flexible enough to fit into place on the boat. And there’s a long steam bin on the other side of the sheds. Once you see wood called Purple Heart, you don’t forget it – it looks beautiful and is very memorable stuff. We listened to Eric’s story about how the project was first using white oak, and then switching to the Purple Heart. But there was a sinking of a barge with the wood off the coast of South America, and it became very expensive after that. We walked over to the large lead ingots, each weighing 6400 to 8500 pounds. They will be used to keep the boat upright, help it to hedge against the ocean’s movements. Juan Cabrillo used large rocks. The new San Salvador is being built using the old technology, but it has higher standards to meet than did Cabrillo’s ships 500 hundred years ago. And it will contain two diesel engines, and a refrigerator. We moved into the space underneath the bridge that connects with Point Loma. Here is where the real work shop is. Saws, sanders, more tools and piles of wood fill the space. We met Roy Libby – one of the main volunteers on site. His smile through his beard and friendly attitude belied the serious cutting work he does. Another volunteer driving the fork lift loaded a huge piece of wood onto his saw’s track as another guy lined it up. Roy told us that the bad economy was actually good for the project, as the construction site attracts unemployed carpenters and boatwrights. You could tell that volunteers here are held in very high esteem. They are what makes this place hum. Eric did caution that anybody who shows up to volunteer – and they can do that anytime between 7:30 am and 4pm, Monday through Friday – must have their own health insurance. “The next phase,” Eric said, “involves 4 to 5 projects, and we need more volunteers.” There is much work to be done, as the ship is only a quarter completed. 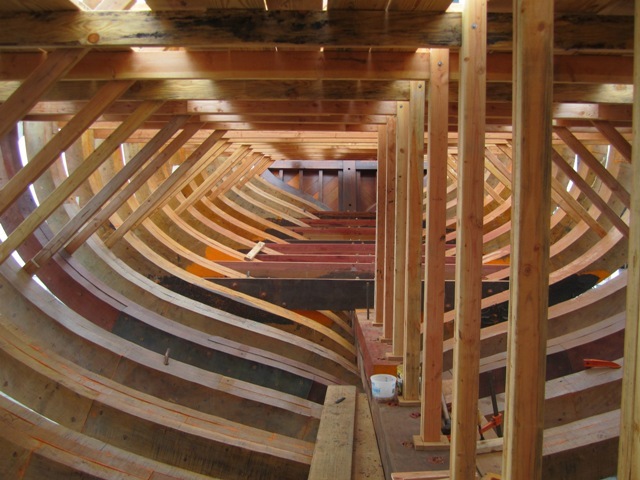 So, if you have any wood-working skills, or boat-making abilities, or just want to be part of this great project, come on down and talk to Eric. Very cool! Now I’m sorry I missed the trip! Don’t know if you can tell by the photos, but Eric gave me the tour twice in order to facilitate all the Ragsters who wanted to attend. I LOVE the OB Rag! I might never have known about this project if not for this article. I’m also sorry I missed the visit on site. I’m a dirt archaeologist who never liked the dirt and always wanted to be a marine archaeologist. I wanted to specialize in preserving ancient wood for ships found, but when I found out you had to dive, I thought I wouldn’t be able to equalize because of sinus problems. Found out a few years ago, that it would not have been a deterrent. Kinda late for me to change now, but I can’t wait to go out and visit the site!! I am a secret sailor, but I get sooooo seasick. This is the perfect place for secret sailors and dirt archaeologists. 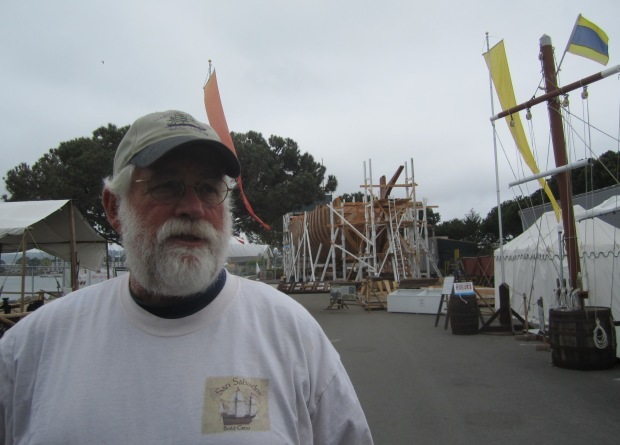 Eric was amazing in his knowledge of the history and the actual boat building. The museum could not have chosen a better “face” for their great endeavor. I loved the smells and looking up through the ribs of that ship. It was majestic. It was poetry. Swell photo’s Patty & Frank. Hey, thanks for the kind words! We sailed together on the Alaska Eagle from Honolulu to Juneau in 1997. It looks like you have a very cool project going. I’d like to check it out when I’m in SoCal. Please send an email to tom.a.rogers@comcast.net, and I’ll respond off the blog. Great article about a great friend and neighbor. 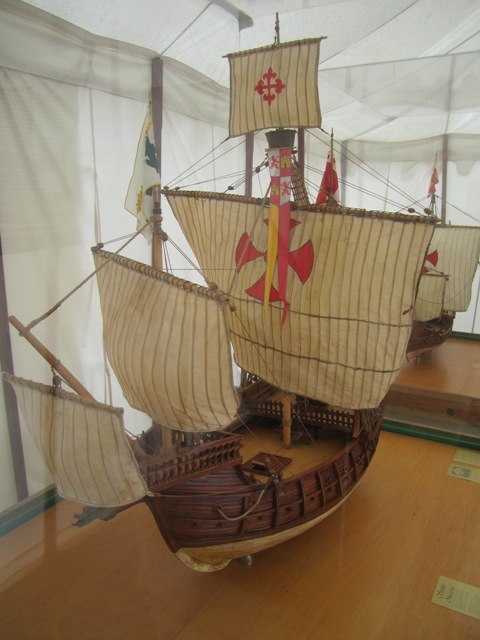 In 1969, a full-scale replica of Nao Santa Maria, the ship that brought Christopher Columbus to America’s mainland coast, was placed in one of the lakes by the government of the time of the Central Park of Caracas, East Park. More recently, the government of Hugo Chávez, considering that vessel a symbol of colonial power, removed the galleon, replacing it with yet another replica, that of galleon “Leander”, which in 1806 transported the War of Independence leader Francisco de Miranda back to Venezuela with the new Venezuelan flag. The process of changing the ship was problematic as the park exists in an “opposition” neighborhood of the city and threats were made against the ship in construction including burning it to the ground. Politics and representation are linked by the symbols we construct and display. Image of the old ship and of the new ship. Older Article: Noam Chomsky: A Rebellious World or a New Dark Age?